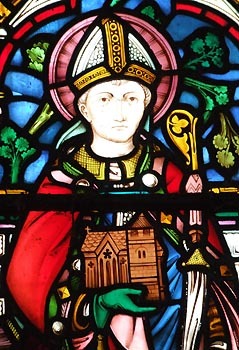 Clether was one of the many saintly sons of King Brychan Brycheiniog. While his brother, Rhein Dremrydd, went on to rule Brycheiniog after their father's death, Clether carved himself out a small sub-kingdom in Northern Dyfed, around Nevern. He married and, like his father, had a large family: some twenty sons. In Clether's old age, St. Brynach arrived at his court and the King decided to relinquish his kingdom to the missionary in order to retire as a hermit. His sons became Brynach's disciples and the memorial of one, Maelgwn, can be seen in Nevern Church to this day. Clether followed his brother, St. Nechtan, to the West Country. He settled in St. Clether where his chapel and well remain as the best preserved in Cerniw (Cornwall). He had another well which he visited in Probus and he is sometimes thought to be the same as St. Cleer in whose village is another famous well. St. Clether died and was buried in St. Clether, apparently on 23rd October. However this date was the dedication date of the parish church at St. Clether in 1259 and it is not clear whether it had a significance before that time.